The Schenectady County Historical Society and the Electric City Food Co-op are teaming up to host an evening of local food tastings and live jazz (featuring Roben Kosek Jazz & Blues) inside Mabee Farm’s historic Dutch Barn, on Saturday, September 24th. 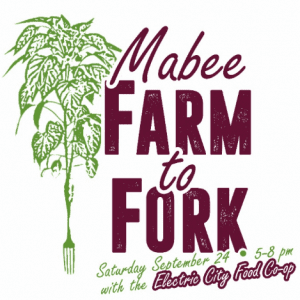 Mabee Farm to Fork will be held from 5 – 8 pm. Tickets are $25 per person and will include local food tastings prepared by chef Christopher Marney. A cash bar will be available for alcoholic drinks. Proceeds from the event will support Mabee Farm Historic Site (part of the Schenectady County Historical Society) and the membership drive for the Electric City Food Co-op. For tickets, and more information, click here, or contact Mary Zawacki at (518) 887-5073, or email curator@schenectadyhistorical.org. The Mabee Farm Historic Site is wheelchair accessible, with off-street parking in front of the George E. Franchere Educational Center.